Special Olympics Illinois athlete Sandra Froman of Normal gave back in a big way this year. Her giving adventure began earlier this year when she finished a quilt that her mother had originally started many years ago. Sandi then donated this precious quilt to be auctioned at the Heartland/Area 6 Holiday Dinner & Auction held Nov. 12. The quilt was originally scheduled to be a part of the silent auction, but when auctioneer Larry Little saw this heartwarming item he made a snap decision to add it to the live auction. When the time came to auction off the quilt, Little asked Sandi to come onstage while he told the story of the quilt and how it had been passed down from mother to daughter to be completed. Everyone in the room was touched and the bidding proceeded at a frenetic pace with the final bid coming in at $700! The anonymous final bidder then said that he wanted Sandi to keep the quilt. Sandi was understandably in tears as she had never expected that type of response for the quilt. “I felt grateful and blessed to help Special Olympics. I was shocked and very humbled by all the attention the quilt drew,” Sandi said. 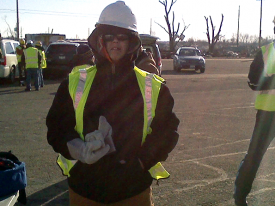 Sandi Froman helped with tornado cleanup in Washington, Ill.
That might have been the end of the story if not for Sandi’s giving heart. It was only a short time after the auction that Washington, Ill., was hit with a devastating tornado that destroyed much of the town. Two Special Olympics athletes’ families lost their homes in the natural disaster. Sandi wanted to continue to pay it forward so she decided that her quilt should go to one of these families to keep them warm in the upcoming cold winter months. 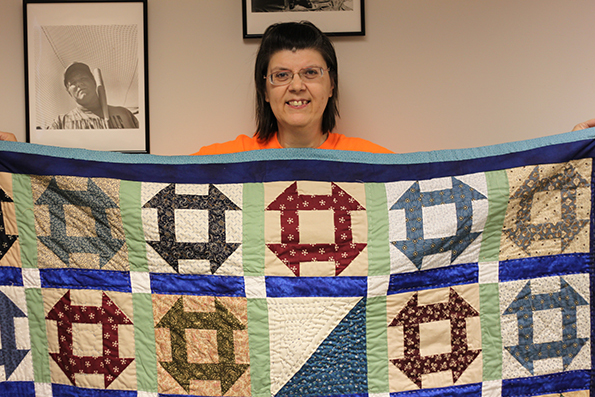 She not only donated the quilt, but also her time as she volunteered Dec. 7 with Heartland Community College to help with the cleanup in Washington. “When I saw what had happened at Washington, I felt a connection and closeness to this community as I went through this years ago,” said Sandi. “I was grateful to be able to help someone else. When we cleaned off a slab where a house was, I felt like we were giving them a chance for a new tomorrow to make new memories.” Sandi encourages everyone who has the time to volunteer in the town’s cleanup and says she plans to do it again. Sandi has been an athlete for more than 25 years, most recently competing in bocce through Special Opportunities Available in Recreation. She is also employed part-time at the Special Olympics Illinois headquarters office in Normal. Sandi Froman truly represents the giving spirit and serves as a shining example of what one person can do to make a difference and to help transform the lives of others. If you would like to help support Sandi and other athletes like her, please donate now.